We all use commentaries and they are not the usual material for book reviews. 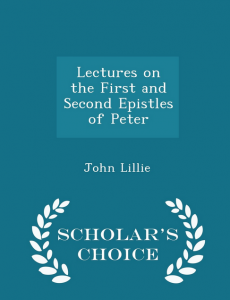 However, having just preached through the book of First Peter and having used this reprinted book (Klock & Klock) throughout, I felt compelled to give old John Lillie my thanks. A Scotchman from the University of Edinburgh, Lillie was pastor of First Presbyterian Church in Kingston, NY most of his life. He is also known for translating 1 & 2 Thessalonians in Lange’s Commentary. An added bonus is the Preface written by well-known church historian, Philip Schaff. Schaff writes, “Here, in a day of many and wide deflections from ‘the old paths,’ is the voice of a trumpet giving no uncertain sound, to summon the scattered hosts back to ‘the good way.’” I profited greatly from both scholarship and practicality.